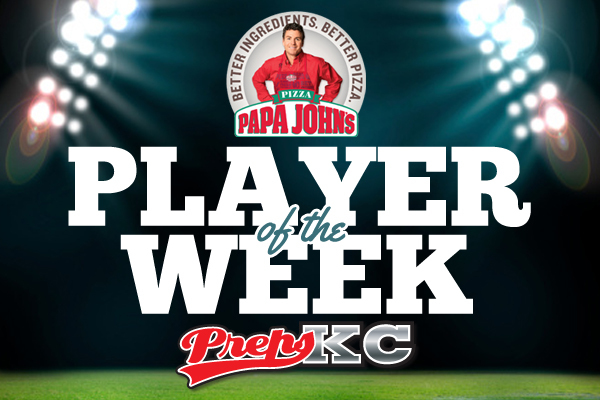 Starting with the first week of the season on both sides of the state line PrepsKC will announce a Papa John’s Player of the Week. Each week those players will be highlighted on PrepsKC.com and in their local Papa John’s location. A player of the week will be awarded for all nine weeks of the regular season. At the end of the Kansas regular season a Papa John’s Player of the Year will be selected from the weekly winners. The year-end winners’ program will receive a $250 donation from Papa John’s and a pizza party for the entire team. The Eagles receiver had a big night even though he only caught three passes. Two of those catches went for touchdowns as he finished with 161 yards to help Olathe North take down Blue Valley North in the first round of the Kansas 6A playoffs. The Jaguars running and defensive back had a big night helping South to a 46-28 win over Francis Howell in the district title game. Cofield finished with 171 yards on 16 attempts while playing stellar defense all night.